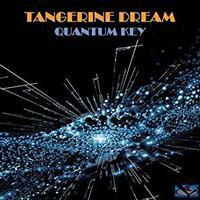 This is a recent EP from Tangerine Dream. The story behind this and the album that followed is an intriguing one since it was a path started by Edgar Froese and realized after his death by his wife and his musical cohorts. I'm reviewing this individually, but also as a the two CD set along with that album, Quantum Gate. While this is worth having on its own, getting it in the box set makes a lot of sense. The story behind this whole project is documented in the booklet to the box set. It should be noted, too, that the opening track here is the closer for the Quantum Gate album, and I've used the same track review in both reviews for the sake of consistency. Coming in gradually, the electronic rhythmic elements and musical drama build nicely. It drops back as it approaches the two and a half minute mark and some violin really adds to the magic of this mellower movement. As works back upward the electronic groove of the piece is just so classy and strong. The violin continues to contribute nicely. Around the five and a half minute mark there is a slightly weird, but still very cool sped up section. The track continues to evolve nicely from there. It gets quite lush as it approaches the end. Rising up gradually, this works out to some pretty and quite powerful electronic sounds. There are some cool melodies built into this thing. The textures that serve up are just plain classic, too. I really love the violin work on this piece. This comes in lush and quite pretty. It grows outward to cool electronic sounds and textures. This continues to evolve as it drives onward with tasty sounds. This is precisely the kind of thing you'd expect from Tangerine Dream. There is a lush, almost soundtrack like vibe to it all. By around the seven minute mark it drops way down and the violin guides a spacey, kind of trippy journey. A mellower electronic element rises up and holds the track until it eventually ends. Tasty electronic textures rise up to move this forward as it starts. It shifts and grows in some tasty ways as it continues to evolve. There are some intriguing twists and turns along this road, but nothing changes quickly.